Would you like to feel peaceful even in difficult circumstances? Would you like all of your relationships to be loving? Would you like to feel more connected to your Source? Our Unity Course in Miracles Group is beginning the new year with something new! 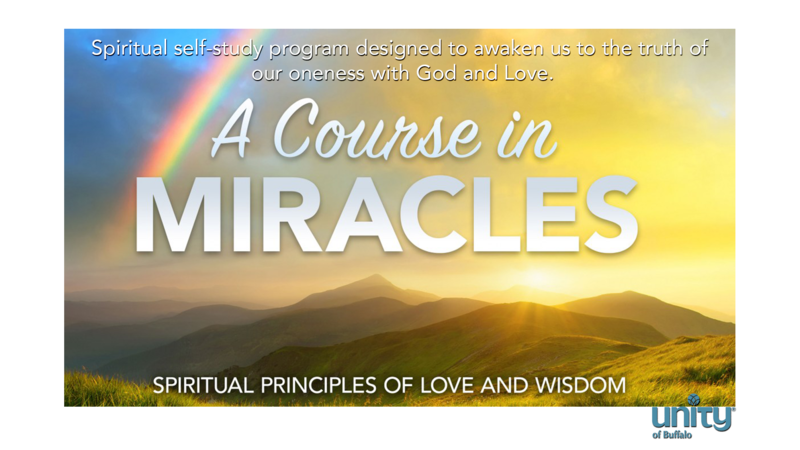 We will be focusing on the Workbook lessons of A Course in Miracles and will review seven lessons each week and discuss the main points of each lesson and share how we used these principles with situations that come up in our daily lives. A Course In Miracles helps us to move from fear to love. The Course helps us to develop a new belief system that sets us free to be the love that we truly are. If you are interested in moving from ego consciousness to Christ consciousness, practicing the Course can help you see yourself and the world in a way that assists you in realizing the Truth. This on-going weekly study group has been meeting at Unity of Buffalo for more than 20 years. The group meets every Tuesday at 5:45 p.m. Some people come regularly every week, others come when they can. Newcomers are always welcome. The conversation and sharing is always rich and meaningful. Unity of Buffalo Friendship Hall, which you can enter through our back door. Repeats every week every Tuesday 300 times .